For students pursuing their postsecondary dreams, entering school is only half the journey. Finishing their degree is just as important. It’s a path that can yield a lifetime of benefits, from personal well-being to societal prosperity. Yet, for many, the cost of college remains too high. That’s where emergency grant programs, offered by institutions nationwide, can make a difference in students’ lives. In a study commissioned by Scholarship America, researchers at Wisconsin HOPE Lab explored practices among emergency aid programs as a first step in identifying effective ways to make college more affordable for students. 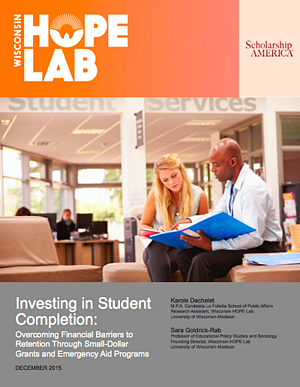 Released yesterday, Investing in Student Completion: Overcoming Financial Barriers to Retention Through Small-Dollar Grants and Emergency Aid Programs sheds light on the current landscape of emergency aid and seeks to address the field’s “nascent approach” by examining how a college or university may create an effective emergency aid program. Establish and communicate clear criteria for program eligibility, while also providing eligibility for determinations in unusual circumstances. Collect and analyze program data to help guide effective practice. Coordinate financial aid and emergency aid when it makes sense, and avoid doing so when it does not help students. Equip emergency aid program administrators with information about other forms of support for students. Evaluate the impact of emergency aid programs to improve performance and buttress funding. Research on emergency aid programs is just starting, and this report paves the way for further work. For some students, an unexpected car repair, bill or textbook cost could be last straw before dropping out. All emergency grant programs surveyed sought to help students overcome unforeseen financial needs like these. Even more alarmingly, one in five community college students say they have gone hungry because of lack of money, according to another recent report by the Wisconsin HOPE Lab on food and housing insecurity among community college students. A majority of students surveyed “had financial aid and jobs, but it wasn’t enough,” the researchers noted in this New York Times op-ed. The presence of small-dollar grants, through programs like Scholarship America’s Dreamkeepers, can help students get through emergencies such as these. Dreamkeepers has come a long way since its inception in 2004. 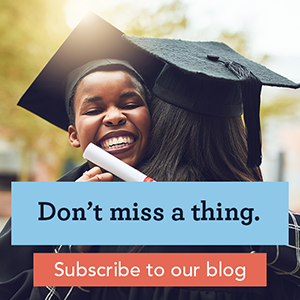 Launched with 11 partner community colleges, the program is now offered at more than 40 institutions across the U.S. Students receive both financial assistance to get them through their unforeseen financial emergency as well as access to additional resources and student services, such as access to financial literacy tools. These resources help students reach their educational goals, ultimately helping to secure a better future for themselves and their families. Dreamkeepers has also grown into a national retention and capacity-building program for participating colleges, providing a safety net for students who may be forced to drop out.